This piece of gold and black picture jasper is a delight for the eye! It has just enough of a picture to cause the eye to focus on it, and the gold is a soft and lovely gold. 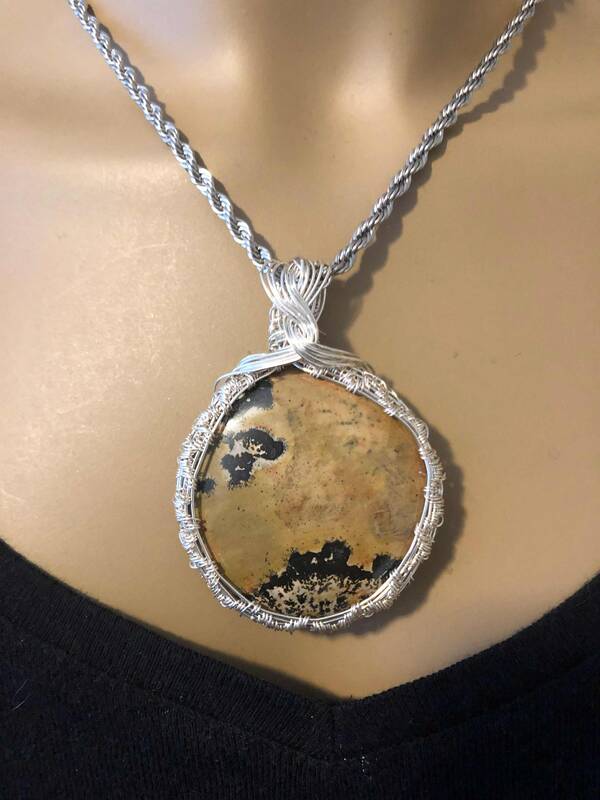 It is wrapped with Sterling and hangs from a stainless steel chain. Including the bail the pice is 2.75" in diameter....just the right size! The chain is 20" and is silver stainless steel. 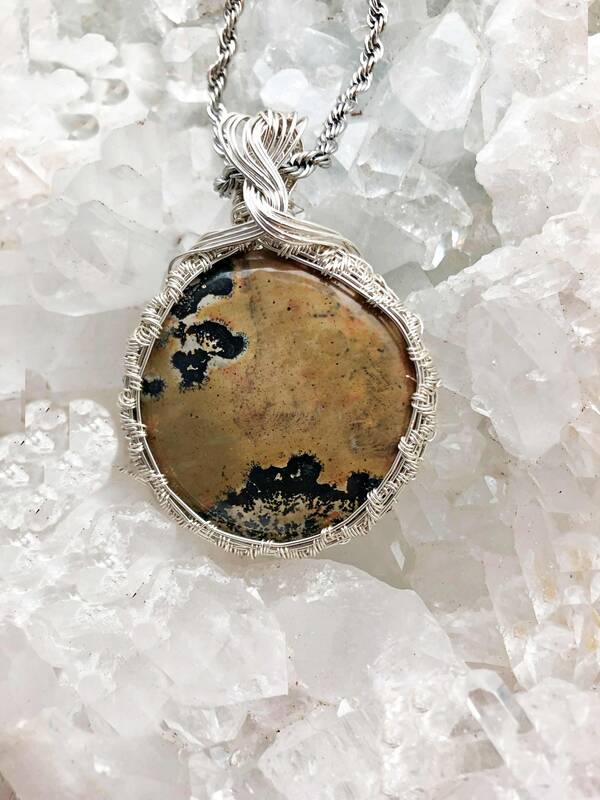 Picture-Jasper is one of the most famous and sought-after stones in the world. It’s a beautiful form of Brown Jasper and can be described by its excellent and seemingly landscape patterns on its surface, formed over time by nature. Picture-Jasper is an opaque stone of the microcrystalline Quartz variety. What sets this stone apart is its extraordinary banding or veining which is created by silicate or petrified mud. It can help in healing the body when it suffers injury or illness. It can also hasten the recovery period after a prolonged illness or an extended stay at the hospital. 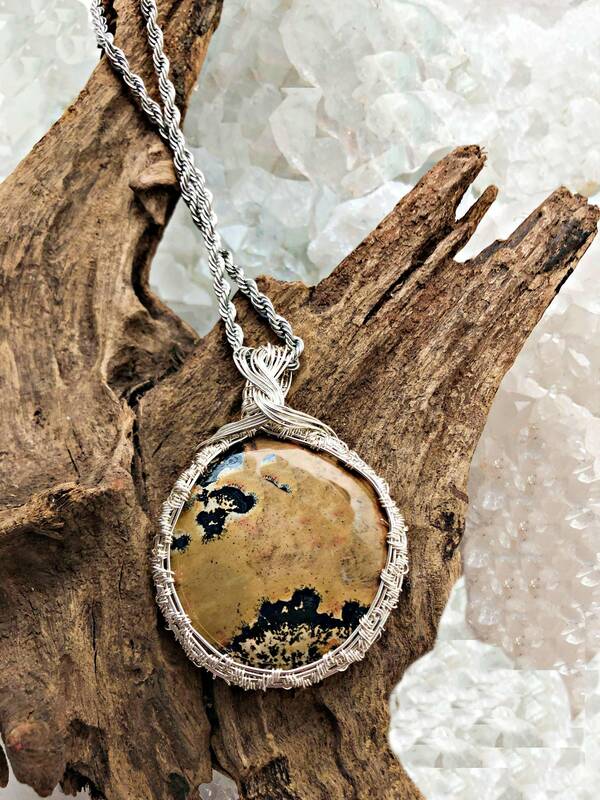 The healing energies of Picture-Jasper can bring gradual physical strength and renewed vitality. It can also help you quit bad habits, like drinking and smoking, and make sure that you quit for good. Picture-Jasper can aid in the treatment of the bowel system. It can also be effective against hernia and conditions that affect the prostate. If you are suffering from IBS, chronic constipation, or obesity, Picture-Jasper can be quite beneficial. It can also provide relief from nosebleeds, colic, and other physical pains in the body. Picture-Jasper is also a stone that you should use if you’re feeling out of balance physically, or if you’re lacking enthusiasm. Picture-Jasper is particularly beneficial in business endeavors, so you should pair it with Lodestone. It will encourage initiative and confidence so that you will be able to get started on your plans and execute them properly. It will inspire creative vision and practicality in starting in your own passion project or business. You will also not be swayed into doing something that can hurt your project or business just because it sounds good and exciting. The energies of Picture-Jasper will show you how you can control your urges and stop being reckless with your decisions. Picture-Jasper will also give you a sense of security and stability. Even if everything is happening so fast, you will not lose your bearings, and you will be able to keep a handle on things. This stone will give you a good sense of your own power. It will emphasize that you can achieve anything you want and accomplish your financial goals by believing in what you can do. Picture-Jasper will make you demonstrate independence and leadership. It will bring energies of abundance and vitality, and it will promote growth and expansion. This stone will help you balance your thoughts and make sure that you are communicating in a healthy and positive way.